This is a reference for those with an interest in the goat. 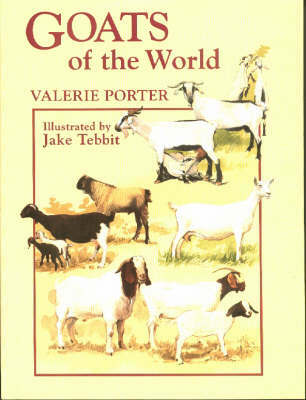 It is based on careful research and covers over 500 breeds and types of goat worldwide. The breed entries are arranged according to the country of origin, and the range covered includes the dairy breeds of Europe and North America, the promising specialised meat breeds from South Africa and the huge range of famous breeds and assorted local types in the Indian subcontinent. Other important types described are the mohair-producing Angora goat from Turkey; the cashmere goats of central Asia; the plethora of new breeds from Brazil; and the feral goats of America, Europe and Australasia. The physical characteristics and genetic features of each goat are given in clear, accessible form, and a glossary and list of breeds and alternative names by which some of them are known are included. More than 180 of these widely-varying goats are illustrated, to scale, in paintings by the livestock artist, Jake Tebbit. The goat is a useful animal, able to thrive where other livestock cannot even survive, but for the most part, its qualities have not been exploited commercially on any great scale. This seems extraordinary to those who know the value of the animal and who appreciate how superbly well-adapted it is to such a wide variety of environments and management situations.